This post is part II of Calistoga’s Tuscan medieval castle lures Napa visitors (VIDEO). After an hour touring the castle and winery of Castello di Amorosa, I was fortunate to settle into the Il Passito Room to relax and wine taste. For the next hour, my wife and I tried 10 different wines and will offer our observations on half of them. After tasting the Vermentino (see previous post), John, our host, suggested we begin with two more whites before moving on to their Rosato and six reds. While the 2011 Pinot Bianco and the 2011 Napa Valley Chardonnay were refreshing, I was most interested in the Castello di Amorosa reds this time round. 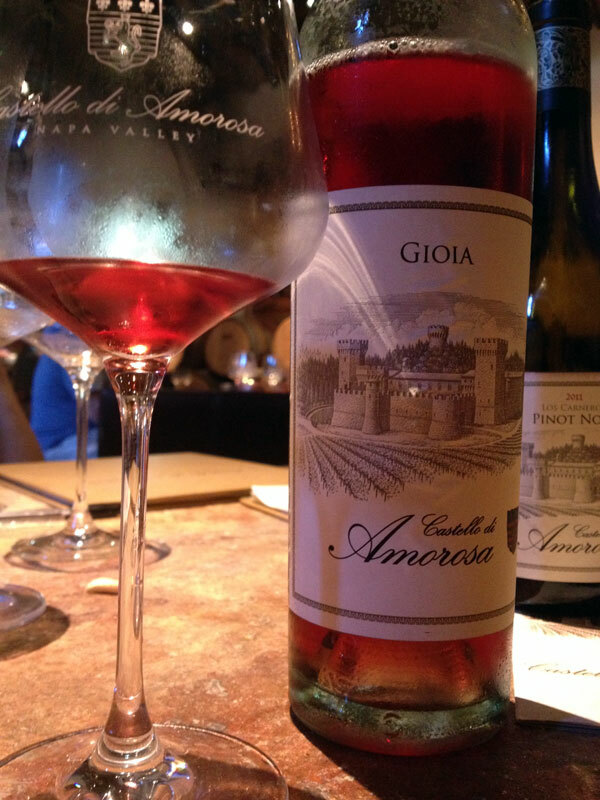 The 2012 Gioia Rosato, a 100% Sangiovese, touts bright strawberry and cranberry flavors with plum and red delicious apple aromas, perfect for picnics. With the heat in California at near record levels, I began the “red” tasting with the 2012 Gioia Rosato di Sangiovese. This Italian-style Rosè is 100% Sangiovese and reflects its darker rosy-red hue. The bright strawberry and cranberry flavors become creamy in the finish while the plum and red delicious apple aromas fill the glass and perfect for picnics, charcuterie or sipping by the pool. For more on my Castello di Amorosa wine tasting experience, return to TalesoftheCork.com for my upcoming post: Tuscan tasting: Castello di Amorosa Pinot Noir. Castello di Amorosa wines are only available at the castle or by mail order. They are not available in restaurants. To order Castello wine, visit their web site at CastellodiAmorosa.com or call 1.707.942.8200. If you missed it, check out Tuscany trip takes Calistoga detour: First stop Fanny’s B&B. Be sure to return check out my Twitter @TalesoftheCork and on my Instagram (talesofthecork) daily postings. I also would covet those who would suggest a wine, restaurant, chef or hotel to visit. Feel free to contact me through social media or via email at talesofthecork@gmail.com.